Augsburg College on October 16 and 17 will host Norwegian parliamentarian Marianne Aasen as she makes her first trip to Minnesota aimed at identifying opportunities for research, business, and educational exchange between Norway and the Upper Midwest. Augsburg President Paul C. Pribbenow invited Aasen to visit the College to further her understanding of U.S. higher education and to explore topics central to her vocation. During the trip, Aasen—who chairs a parliamentary committee on research and education—will meet U.S. scholars who collaborate with Norwegian researchers and will discuss educational issues with faculty members in the College's Education and Social Work departments. "We are pleased to have the opportunity to welcome Marianne Aasen to campus," Pribbenow said. "I am excited to see how the visit strengthens the relationship between Aasen and Augsburg, and between her nation and ours." 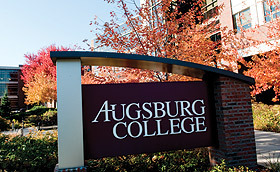 As the first seminary founded by Norwegian Lutherans in America, Augsburg is rooted in its heritage and regularly hosts events and dignitaries with Norwegian ties. One notable connection between Augsburg and Norway is the College's role as an official host of the Nobel Peace Prize Forum (NPPF), an annual event through which students and other citizens engage in peacemaking efforts around the world. The NPPF is the Norwegian Nobel Institute's only affiliated program outside of Norway, and Aasen's visit to Augsburg will occur less than one week after the Institute in Oslo awarded the 2012 Nobel Peace Prize to the European Union. Dozens of Augsburg students will have the opportunity to visit with Aasen, whose schedule includes meeting students with ties to Norway and attending an environmental politics class instructed by Joe Underhill, associate professor and chair of Political Science. Students from Norway studying at Augsburg will discuss their international educational experience with Aasen at a lunch hosted by Gary Gandrud, Norwegian Honorary Consul General, and Christina Carleton, Norwegian Honorary Vice Consul. They will be joined by staff from the College's Languages and Cross-cultural Studies department and Office of International Programs. Aasen also will meet NPPF student interns and the College's Peace Scholars, students who were selected to participate in a summer 2012 learning seminar in Norway. The Peace Scholars program deepened their understanding of issues related to peace, justice, democracy, and human rights. "When President Pribbenow and I met with Mrs. Aasen at the Norwegian parliament in June, she expressed a keen interest in the Nobel Peace Prize Forum," said Maureen Reed, executive director of the NPPF. "Because the Nobel Peace Prize is so strongly associated with Norway, she immediately understood how the Forum's visibility and prestige could be useful in helping forge education, research, and business relationships. Her meetings with students, faculty, and government officials exemplify this." Aasen will round out her visit to the Twin Cities by touring the Minnesota State Capitol and meeting Lieutenant Govenor Yvonne Prettner Solon, by visiting researchers at the University of Minnesota, and by meeting with Larry Pogemiller, director of the Minnesota Office of Higher Education.